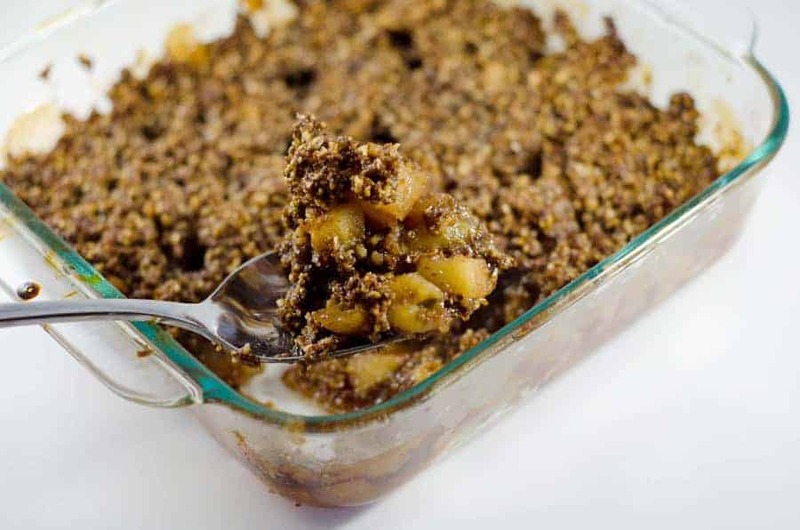 I knoooow – I’m supposed to be gearing up for a Whole30 in January, and Whole30 does not include an apple cobbler recipe. But I still have a few more days, which means you still have a few more days, which means you can probably make and consume this recipe before your Whole30 starts. Not that that is something I would recommend or would know about. Let’s just say the score is Scullys =1, Apple Cobbler Leftovers = 0 and leave it at that, mkay? Besides, as I write this post, I’m eating a steak caesar salad that consists of lettuce, steak, and homemade caesar dressing, so I’m super healthy. Not my recipe, I used this one, but I made the rookie mistake of not reading all the way through. I was stuck drizzling oil into a running food processor to make an emulsion, which I haven’t done in years. An immersion blender (I use this one) does in 2 minutes what used to take me 20. Aaaand you can use it to pureé soups directly in the pot – no waiting for it to cool, then putting in the blender in small batches, wasting hours in the kitchen. Just stick the immersion blender directly into the pot of hot soup and pulse it around, then run it through until it’s smooth and creamy. 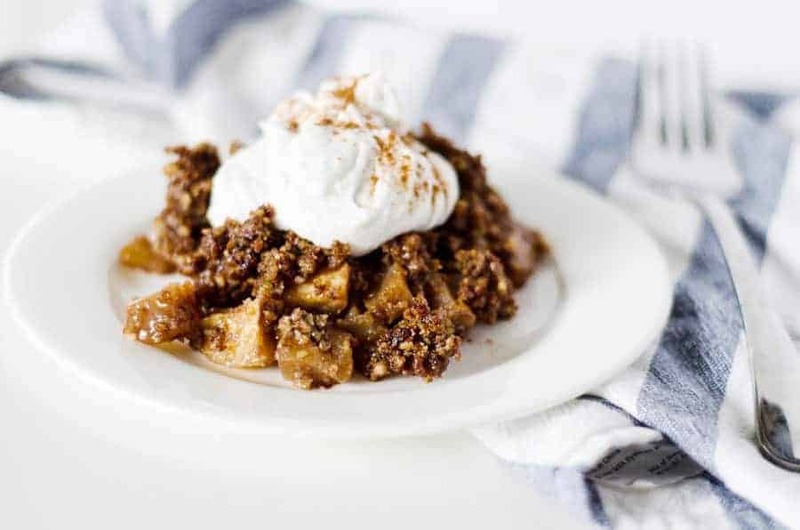 Anyway, this is an apple cobbler recipe, not a salad dressing or soup recipe, so let’s get back to the important stuff: this gooey apple deliciousness right here. I know a lot of people get all grumpy when it comes to Paleo treats and desserts, and I hear you. There are some things that just can’t be re-created in the Paleo world. But hear me out – what if, instead of trying to re-create something that already exists, you just make something delicious with what you have available to you in your Paleo pantry? Cakes, pies, muffins – anything with flour that rises, I agree – it’s either right out the door or it takes way too long to prepare to make it worth my time. However. There are exceptions to this rule. Danielle Walker’s Real Deal Chocolate Chip Cookies make the list, as do my Pumpkin Whoopie Pies over on Healy Eats Real, Wicked Spatula’s Edible Chocolate Chip Cookie Dough, and a number of brownie recipes that are out there that result in a fudgy, dense brownie. 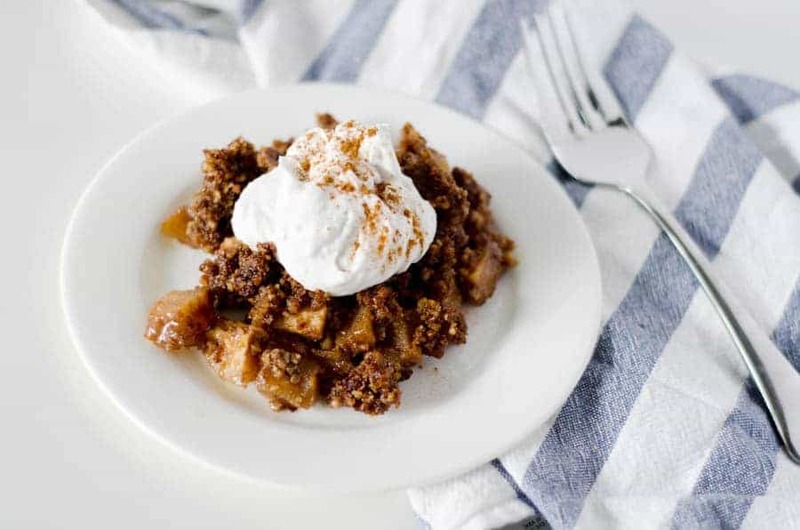 And now, this apple cobbler recipe has joined the lineup. This recipe comes together in 15 minutes, you can pop it in the oven while you’re eating dinner, and it’ll be ready by the time you’re done eating. An important side note, if you want to top it with the coconut whipped cream, you’ll need to stick that can in at least an hour ahead of time, but preferably overnight. If not, just put it in the fridge when you start cooking dinner and it’ll be ready for you by the time the cobbler comes out of the oven. The apples come out tender but not mushy, and are coated with deliciousness. The topping gets crispy in the last 5-10 minutes of baking, so be sure not to cheat the time. It’s sweet and crunchy and crumbly and is all the things I’ve ever wanted in a crumb topping. The whipped cream takes it over the top for realz. Peel, core, and dice apples into large chunks and place in an 8x8 baking dish. Combine tapioca starch, cinnamon, and salt in a small bowl and set aside. Combine maple syrup and lemon juice in a small bowl, then add to the apples and toss to coat. Sprinkle the apples with the tapioca starch mixture; toss again to coat evenly. In the bowl of a food processor, combine all topping ingredients and pulse until a crumbly mixture forms. Sprinkle the topping evenly over the apple mixture. 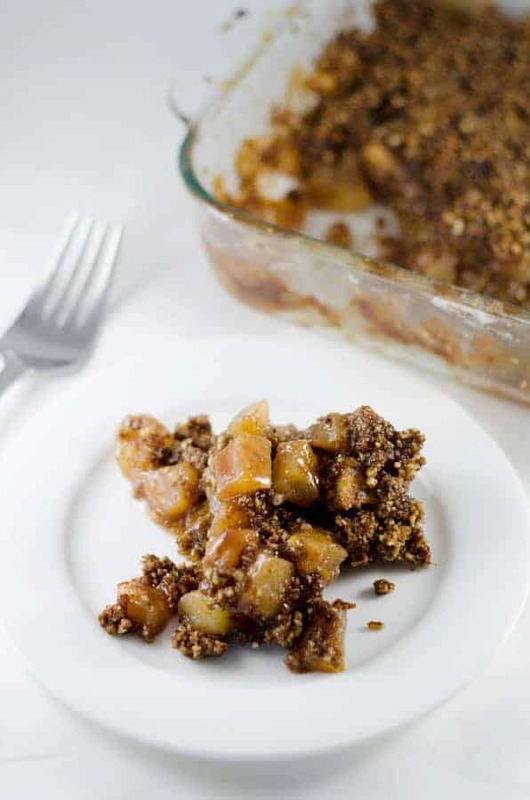 Bake for 40-45 minutes, until apples are tender and topping is brown and bubbly. While cobbler is baking, remove coconut milk from the fridge. Spoon out solidified coconut cream, reserving separated water for another use. 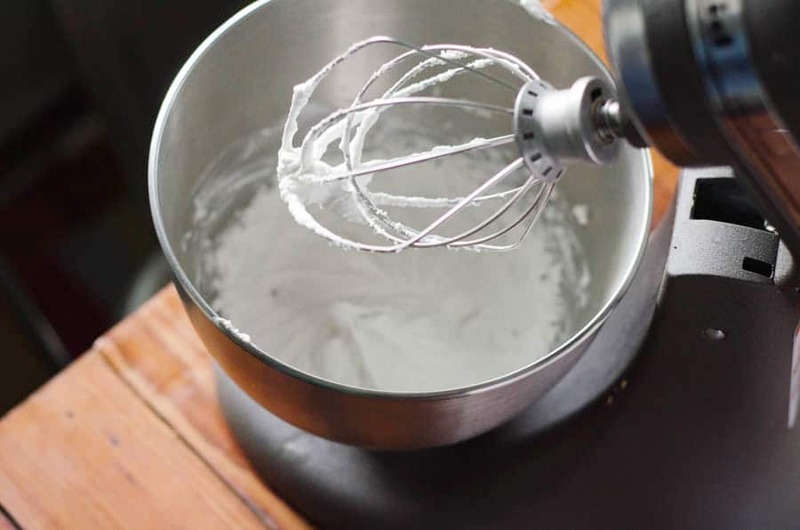 Place coconut cream in the bowl of a stand mixer and beat on high until light and fluffy. 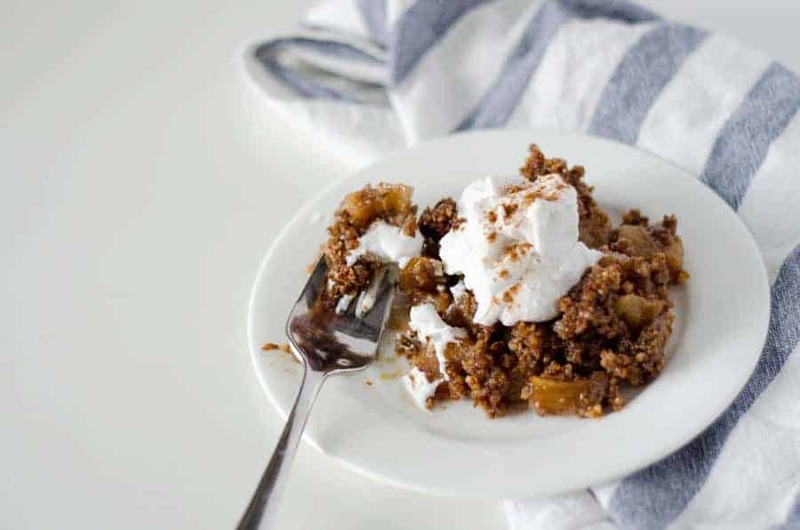 To serve, spoon the cobbler into a bowl, then top with the coconut whipped cream.